This is one of those books that all cooks should be exposed to at least once. It organizes the world of food in a completely novel, but understandable, way. The idea is that each cuisine builds off of a few basic differences that set it apart from other cuisines. 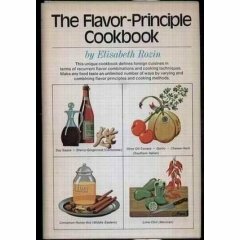 Choice of ingredients, cooking techniques, and flavor principles. The book concentrates on the last one. Flavor principles are the way in which a culture combines ingredients for a unique taste. For example, Italy combines garlic with tomato but in Greece, they add cinnamon to the tomato instead. The difference between Korean and Indonesian cooking which both use soy sauce, brown sugar, and chile? Koreans add sesame and Indonesians add peanut. 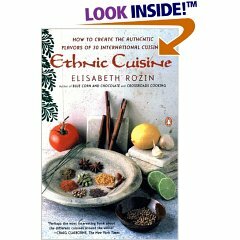 For any cook, or anyone who enjoys eating different ethnic foods, Rozin’s book helps to clarify and enlighten. For a cook dealing with food restrictions, the book can be extremely practical. It’s easy to get stuck in the flavor principles we’re used to. So when we suddenly can have a particular ingredient, we feel trapped and end up with food that just isn’t right, though we can’t figure out how to fix it. Each cuisine illustrated in the book is rich and full with the ingredients that they have. So if you want ideas on creating flavor without garlic, for example, there are many alternatives you may not have thought of (who thinks to add cinnamon?). The majority of the cultures listed don’t use dairy at all and many don’t use wheat, and the sample recipes reflect that. If you find a cuisine you like, now you know how to name it and you can go get books with a broader range of recipes. The book does have its flaws, though they are mostly in leaving you wanting more. A map would have been nice. A chart of the flavor principles by region, not just a list. Better indexes and table of contents. And simply more of everything. More cuisines represented, more flavor principles, more details, more about cooking technique and ingredient choice. In short, I love this teaser of a book but I want to buy the encyclopedia.